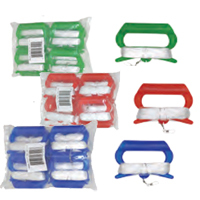 This 12 piece pack of 20 LB, 30LB or 50LB x 300 ft' twisted polyester line comes on a durable plastic flatwinder handle and features an attached snap swivel for simple kite connectivity. A remarkably easy way to retrieve a line, simply wind in a figure of 8 pattern around the winder and next time you fly, line will unwind from the winder separately and ready to go! Continous lengths of high quality braided Polyester flying line for single line kites. On tube, Braided Dacron line is lightly waxed to help keep the tow point in place and prevent slippage. Available in variety of weights and lengths. 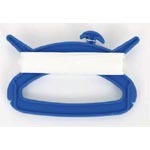 This is a premium line for your finest single line kites and is perfect for bridles on any kite. We buy this braded Decron direct from MFG in USA, no middle man markup you save 40% to 60%. MADE IN USA. Continous lengths of high quality braided Dacron flying line for single line kites. 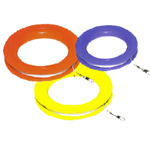 Continous lengths of high quality Twisted Nylon flying line for single line kites. On tube. We buy this Twisted Nylon direct from MFG in USA, no middle man markup you save 40% to 60%. MADE IN USA.